This timeless saying instantly came to mind when I first heard about the suggestion to help send the Anak Laut to school as W3-O’s 2011 outreach programme. After all, we’re talking about a group of indigenous people who, through countless generations, never learned to read or write, and never went to school. This endeavour will give their children a fighting chance to survive a rapidly changing global scenario well into the next millennium. Without this chance, the word “extinct” comes to mind instead. Next question was how to raise funds. From several worthy endeavours came the sweetest of them all- selling chocolates! 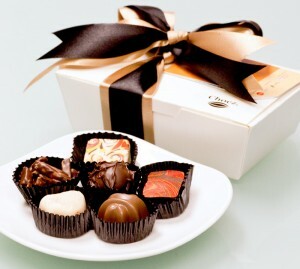 Initially, the plan was to make the chocolates ourselves but when it became apparent that it may not be worth the effort, we took the experts in and forged a partnership with specialty chocolate shop “Chocz”. The packaging of the chocolates, on the other hand, was a labour of love by the W3-O volunteers as everyone spent countless after-office hours for over a month- daintily arranging each praline in a box, placing stickers, placing notes and a very tricky ribbon tying that demanded perhaps more than a dozen trials to gain perfection. Not to mention of course the selling part, this was a frantic rally for everyone to hit a high sales target that we’ve set for ourselves. After several weeks of selling, planning and packaging, D-Day finally came. From the get go, it was a “sacrifice” as a manner of speaking as we had to wake up in the wee hours of the morning, when the world was still literally covered with darkness for our trip. In fact, the night before was another tiring streak as we stayed late to prepare and pack the goodies for the school kids- a package consisting of snacks like drinks, fruits and cookies, plus school stuff like pens, papers. Now imagine preparing close to 200 of these. The sea travel was a welcome respite though as it was relatively calm, even soothing to a point. I was expecting a rough ride, but then even the weather and the sun was smiling warmly at us. 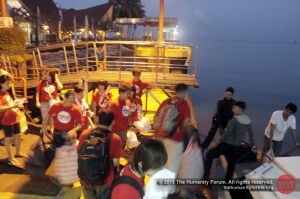 The smiles that greeted us at the jetty when we arrived were even warmer. Our bright red convoy, on the account of the bright red THF shirt all of us were wearing, gleefully snaked through the trail towards to school, with some huffing and puffing, as we were carrying the goodies and other donations that also included like guitars and a musical keyboard. Following closely behind were some of the Suku Laut women, all smiles that despite the language barrier, seem to encourage us to move forward. The scene that welcomed at the school was an exhilarating sight. Hundreds of school kids running to and fro, laughing, shrieking, finally coming to a grinding halt and hushed silence as the school principal ordered them to assemble accordingly. I learned that the kids were assembled that they specifically for our programme, as it was a Saturday. None of them looked reluctant though as each face was a picture of excitement and anxiousness. It was enough to melt one’s tiredness from the late night before and sleepiness in the early morning. But, the programme has just begun. Our bright red convoy, on the account of the bright red THF shirt all of us were wearing, gleefully snaked through the trail towards to school, with some huffing and puffing, as we were carrying the goodies and other donations like guitars and a musical keyboard. Following closely behind were some of the Suku Laut women, all smiles that despite the language barrier, seem to encourage us to move forward. The scene that welcomed us at the school was an exhilarating sight. Hundreds of school kids running to and fro, laughing, shrieking, finally coming to a grinding halt and hushed silence as the school principal ordered them to assemble accordingly. 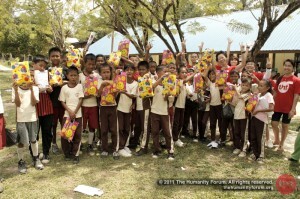 I learned that the kids were assembled that day specifically for our programme, as it was a Saturday. None of them seemed to mind though as each face was a picture of excitement and anxiousness. It was enough to melt one’s tiredness from the late night before and sleepiness in the early morning. But, the programme has just begun. Our group was divided into several sections so that the kids will get to learn and experience different crafts despite the short time that we would be together. Some of us will be teaching songs, others will be teaching arts, and others would even be playing sports. 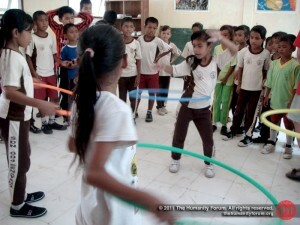 Similarly, the school children were divided into groups, according to age and grade, as some activities may not be suitable for the young ones – like in my group’s case wherein we were teaching songs so difficulty levels were to be considered. The next 3 hours or so was a frantic, stimulating rush of activity as we went about teaching the kids and more – chatting with them, playing with them, even trading jokes. The whole school was abuzz with children laughing, singing, shrieking with glee despite a more than usual hot day. Finally, an “awarding ceremony” was conducted as we officially passed the goodies and other donations to our gushing, very grateful recipients. After enjoying our lunch with the kids, most of us felt beat and tired. But the day isn’t through, just yet. There were more and newer experiences to come. Official handover of the donation to the school. The kids and the goody bags. It was time to finally meet the Suku Laut people. 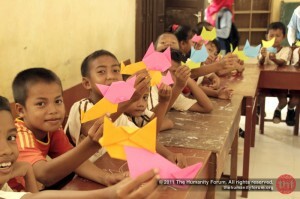 Among the donations were 2 specially made “school boats”, painted with the distinctive yellow and black letters of a typical school bus, which the Anak Laut would be using to transport them across the body of water that divides their home and school. As these weren’t big enough to accommodate our group, not everyone managed to go. 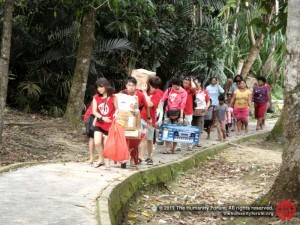 Upon reaching their homes, we realised it’s not just the boats that won’t be able to accommodate all of us. The homes itself, while not decrepit, were neither that strong nor big. One of the wooden planks cracked with the weight of a colleague. Less than a kilometre away from the village, life looked markedly different at the Suku Laut’s homes which were built on stilts. While they have the amenities of modern life like TV (not sure if it actually works), a mobile phone even, the living condition is far from ideal as the space looks cramped, the furnishing bare. Their lot in life can be so much better. 2 brand new "Sampan Sekolah", the school boats. 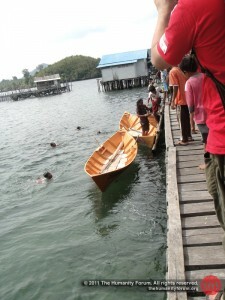 The school boat outside the homes of "anak laut", the sea tribe children. The official handover of the boats to the head of Suku Laut community. School bags with stationery and shirts, for all anak lauts. It would take so much more than a mobile phone to adapt to the demands of a far more competitive world, whose resources are fast depleting and only those with access to “information” will be better equipped to face the challenges of a new world. That information should begin right at the very beginning so to speak, by sending children to school so they can have the building blocks towards higher learning and having better options in life. Now, that has become possible for the Suku Laut people and their kids, the Anak Laut. Overall, it was a very memorable trip, very memorable experience – from the boat ride to the kids’ smiles. Other experiences were more on a personal note, like “the non-existence of time that I felt. How everything was in slow-motion and I could take my time to inhale the surroundings, which I can’t back in Singapore”. And yes, the simple fact that “doing your part and giving effort” for the sake of others is something else, something that gives a new dimension to having a meaning in life. Anak lauts at school, finally. For more photos, please visit Programme Gallery or THF’s Flickr album.